Perfect size, trusted brand, perfect amount. We've been using Zinc Piolinate by Thorne Research for years and love it! 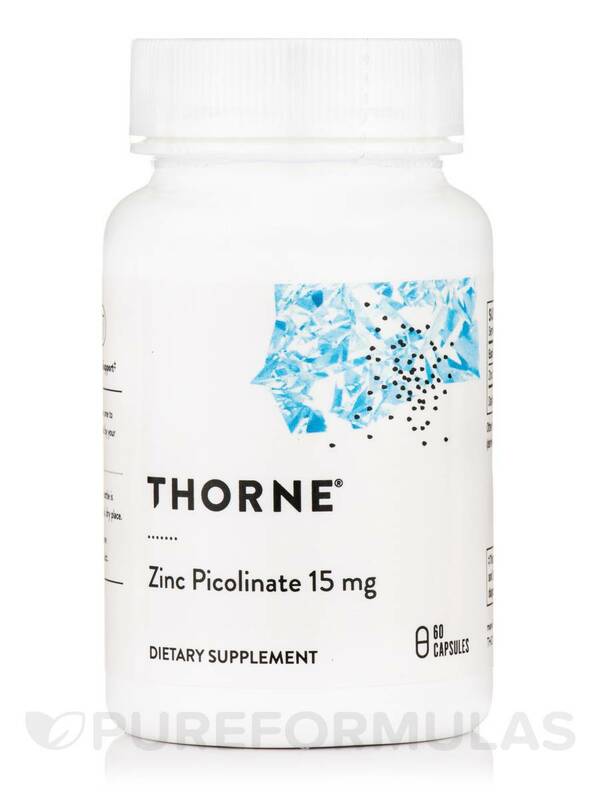 Zinc Picolinate by Thorne Research has helped with skin and anxiety. I take 1 per day after food. 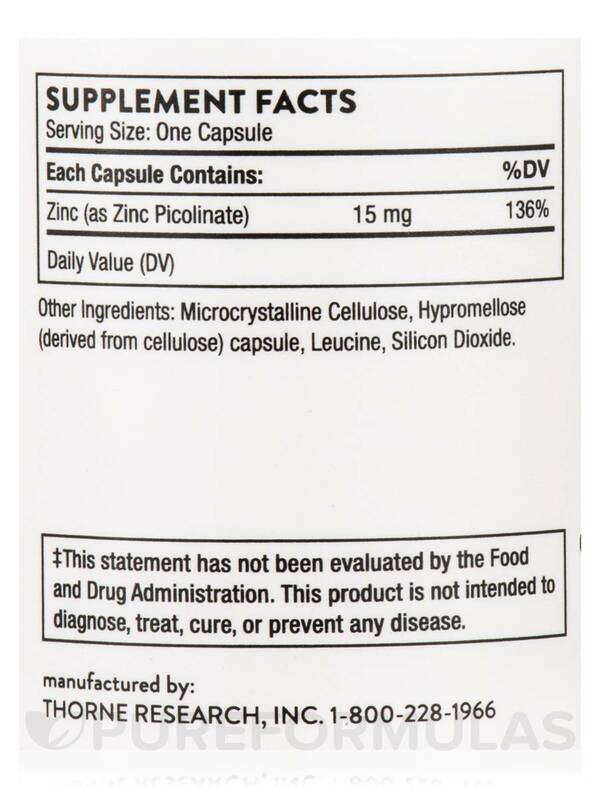 Zinc Picolinate features better absorbability than many other zinc supplements. Supplementation can be important for many persons‚ including athletes who lose zinc in sweat during intense exercise. Zinc is essential for growth‚ immune function‚ testosterone metabolism‚ and numerous other functions in the body. Zinc is involved in more than 200 enzymatic reactions and plays a key role in genetic expression‚ cell division‚ and growth. 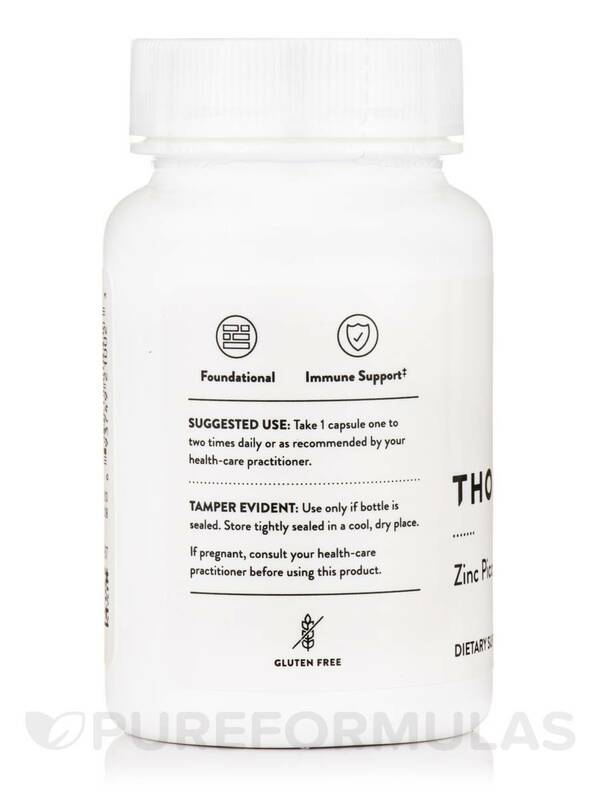 Clinical studies demonstrate zinc supplementation can increase general wellness‚ and that it has a beneficial impact on connective tissue‚ as well as reproductive and eye health. However‚ not all zinc supplements are absorbed efficiently by the body. Picolinic acid is a natural mineral chelator produced from the amino acid tryptophan in the liver and kidneys‚ and then transported to the pancreas. During digestion‚ the picolinic acid is secreted from the pancreas into the small intestine‚ where it binds to minerals‚ such as zinc‚ to facilitate the mineral's absorption. Individuals susceptible to zinc deficiency include the elderly‚ the immuno-compromised‚ those on parenteral nutrition‚ burn victims‚ and athletes. Adequate Zinc levels are needed to support the body's normal production of testosterone‚ a hormone essential for promoting lean muscle mass . 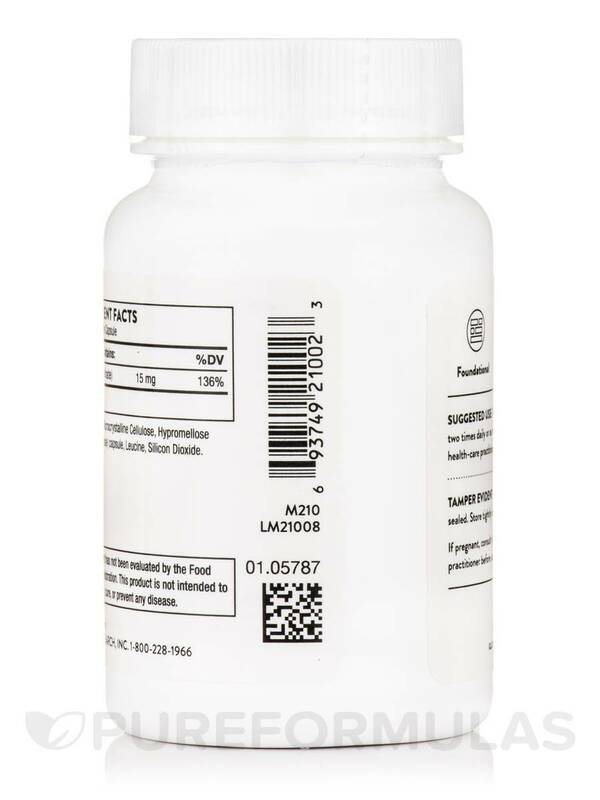 Other Ingredients: Microcrystalline Cellulose‚ Hypromellose (derived from cellulose) capsule‚ Leucine‚ Silicon Dioxide. Hard to find a zinc pico with no additives/fillers. This is the closest I could find. 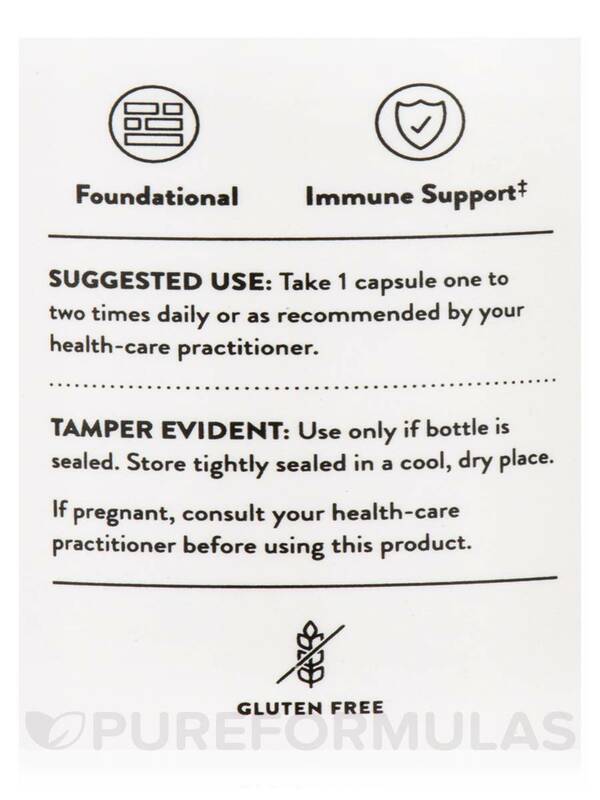 Works well enough with minimal filler side effects. Amazing combination, small bottle but you get what you pay for! Great company! I love Zinc Picolinate by Thorne Research! Great quality and price. Trusted brand. We did not respond as well as we did with this Zinc Picolinate by Thorne Research as the citrate zinc. It was okay. My eye doctor wants me to take extra zinc for the onset of macular degeneration. I have always been happy with Thorne products so I decided to try Zinc Picolinate by Thorne Resarch. My last appointment showed my degeneration has not worsened and could get better. No stomach problems if taken with food. 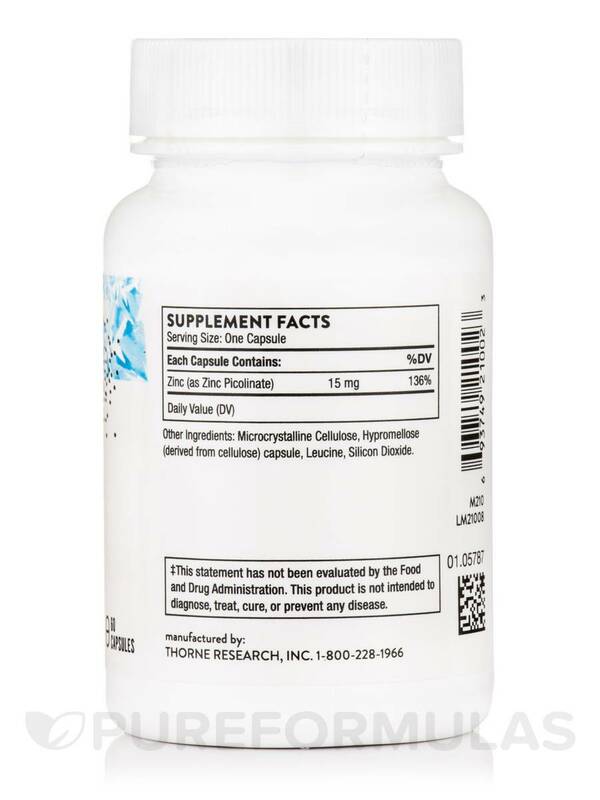 This clean Zinc Picolinate by Thorne Research offers mental clarity and comfort. Go for it! My experience with this after one week is worthwhile. Reading about the absorbability of Picolinate proves it!